US biotech giant Monsanto is legally responsible for the ill health of a farmer who ingested its weedkiller product, a French court has ruled. A French appeals court ruled in favour of 55-year-old Paul Francois, who has fought a decade-long legal battle against the firm. He fell ill after inhaling vapour from Lasso, a now banned herbicide, in 2004. Mr Francois blames Monsanto, accusing it of not giving sufficient safety warnings. Bayer AG, the German pharmaceutical company that acquired Monsanto in 2018, confirmed Thursday's ruling and said it was considering its legal options, including an appeal. A spokeswoman told the BBC: "We are currently reviewing the decision of the court." Previous rulings in 2012 and 2015 had found Monsanto legally responsible for the poisoning of Mr Francois. In 2017, those judgements were overturned by France's top court, which ordered a new hearing. 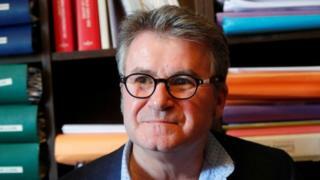 Now, having won an appeal against that decision, Mr Francois's case will now be heard by another court in the south-eastern city of Lyon, Reuters news agency reports. Last month, France 24 reported that Mr Francois was seeking more than €1m (£764,000) in damages from Monsanto. The latest ruling made no judgment on compensation. In a statement, a spokeswoman for Bayer AG told the BBC it was "committed to a fair understanding of each personal case" but suggested Mr Francois's case was an "exception". "Plant protection products are among the products whose evaluation and authorisation are the most strictly regulated in the world. They are safe when used as directed," the spokeswoman added. What happened to Mr Francois? Mr Francois claims he has suffered memory loss, headaches and stammering after accidentally inhaling the Lasso. As a result, Mr Francois, a cereal farmer from the Charente region in south-west France, had to stop work. Medical tests found the hazardous chemical chlorobenzene in his body. He complained that Monsanto had failed to give a warning on the Lasso label. The initial ruling was described as a "historic decision" by his lawyer Francois Lafforgue, who said it was the first time a herbicide maker was "found guilty of such a poisoning". Lasso has been banned in France since 2007 and had already been withdrawn in other countries prior to that. The ruling in the French case comes as Monsanto faces lawsuits in the United States over alleged cancer links to its glyphosate-based weedkillers. Weedkiller cancer ruling: What do we know about glyphosate?